When he first started, even the inexperienced observer saw his skills. Cristiano Ronaldo has been a pre-eminent football player on the world stage for so long that we forget how he got here. What were his early years like and what did people see in him that he was taken by youth football at a young age and groomed for stardom? 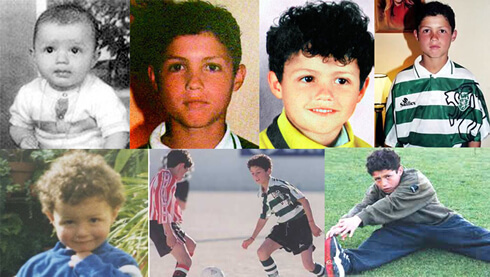 Cristiano Ronaldo grew up on the island of Madeira, a Portuguese archipelago to the southwest of Portugal. He played football in old, worn shoes that his older brother had worn before him. He loved the game and played for the love of it. Before he played youth football in Madeira, he and his friends played in busy city streets. They didn't even have a park nearby where they could play without worrying about cars. Today, Madeira is quite affluent with a casino and a five star hotel. And anyone who decides to play casino games at home can access his or her favourite online casino free games. Ronaldo's father was also an alcoholic. In the end, his father died of the complications of alcoholism. According to multiple reports, Ronaldo doubtless saw his father drunk many times. He began playing youth football when he was 7 years old and by the time he was 11, everyone knew that he had outgrown Madeira. His family sent him to the football academy in Lisbon. Because his family had little money and lived on an island far from any mainland, he was essentially alone: a young boy from the island suddenly thrust into the world of Portugal's capital city. His family came to see him only three times a year. The first thing that Ronaldo demonstrated as a football player was great speed. It's an uncommon ability to be able to move with the ball at high speed through the opposing team's defence. Ronaldo excelled at fast dribbling even as a very young boy. Ronaldo also showed great leaping ability. Football is one sport where leaping is a prime talent as, without the use of their hands, football players use their heads. 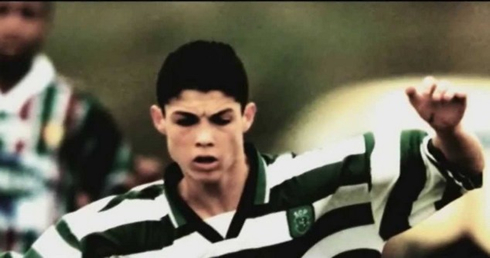 The third great talent Ronaldo demonstrated even as a very young boy was a powerful foot. Today, his free kicks can travel at speeds close to 130km per hour. Back then, he couldn't kick nearly as hard, but he could kick harder than anyone had ever seen on the Madeira Island in a boy of his age. Given that his father was an equipment man for the local team, Ronaldo had more opportunities to see players older than him in action. 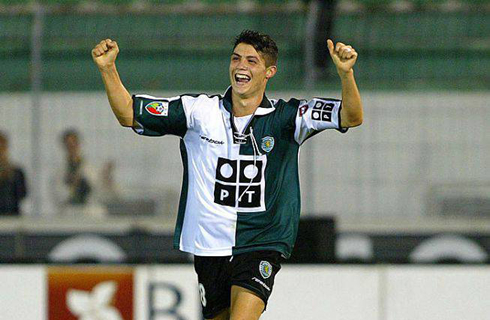 As any young boy might do, Ronaldo tried to imitate the older boys. What amazed and awed onlookers was that Ronaldo was able to successfully learn many of the techniques he saw the older boys do. 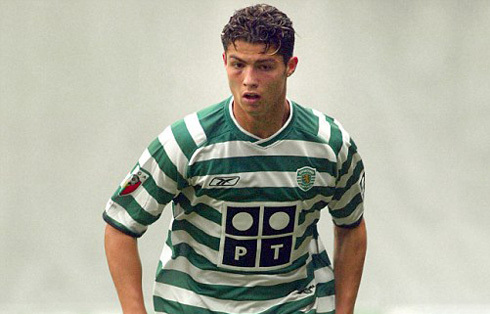 The last great skill that Ronaldo showed as a young boy was the ability to play with both feet. This is far more difficult than one might expect. Everyone has a dominant hand and a dominant foot, but people saw that Ronaldo was equally skilled with either foot. Even though he had grown up speaking Portuguese, the Portuguese of the capital sounded very different to the young boy. The big city culture was different. The pace of everything was faster. 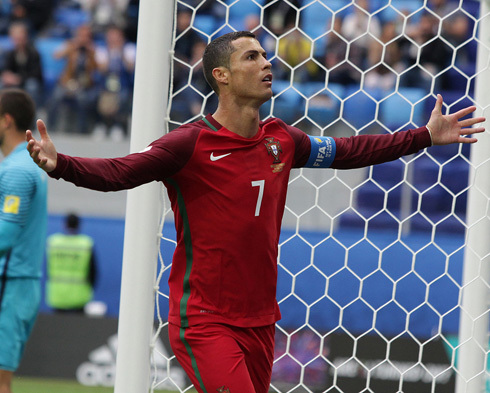 From the outset at the academy, Ronaldo was not just the best player in his age bracket; he was recognized as the most talented player in the academy. The only drawback to eventual stardom in European football was his size. He was extremely small even for a sport where stature is of less importance than general talent. Ronaldo worked out on his own and got stronger. He began playing professionally at 17 and had his heart set on playing in the Premier League. His favorite team was Manchester United. Everything almost came to a swift end when Ronaldo was diagnosed with an irregular heartbeat. His heart raced. It was almost as if his heart reflected his football talent, but the heart almost forced him to give up football. Today, it is accepted that Ronaldo worked out too much and too severely. He actually did some internal damage making himself stronger and faster. The most famous story of Ronaldo's early years in Madeira involves a teammate and good friend Albert Fantrau. The Sporting Lisbon Academy came to watch a game and told the players that they would accept whoever scored the most goals that day. Ronaldo had one and Fantrau had one. Then, later in that game, Fantrau had an open net to score again, but passed the ball to Ronaldo. He later said that he did so because Ronaldo was the better player and deserved the chance to play in Lisbon. Cristiano Ronaldo next game for Real Madrid is on March 10 of 2018 against Eibar. You can watch Juventus live stream, Eibar vs Real Madrid, Malaga vs Barcelona, Manchester United vs Liverpool, Chelsea vs Crystal Palace, and Newcastle vs Southampton, all matches provided from our live football game pages.